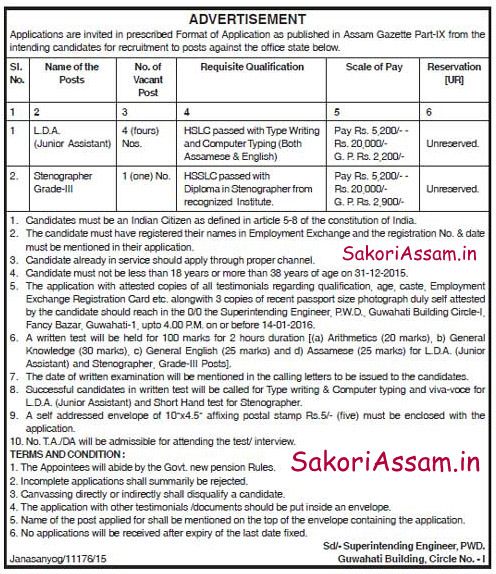 Applications are invited in prescribed Format of Application as published in Assam Gazette Part-IX from the intending candidates for recruitment to the posts against the office state below. The last date of application is 14th January, 2016. No applications will be received after expiry of the last date fixed. Educational Qualification: HSSLC Passed with Diploma in Stenographer from recognized Institute. The application with attested copies of all testimonials regarding qualification, age, caste, Employment Exchange Registration Card etc. along with 3 copies of recent passport size photograph duly self attested by the candidate should reach in the O/o the Superintending Engineer, P.W.D. Guwahati Building Circle-I, Fancy Bazar, Guwahati-1, upto 4.00 P.M. on or before 14-01-2016. A self addressed envelope of 10’’ x 4.5’’ affixing postal stamp Rs.5/- (five) must be enclosed with the application. Name of the post applied for shall be mentioned on the top of the envelope containing the application.